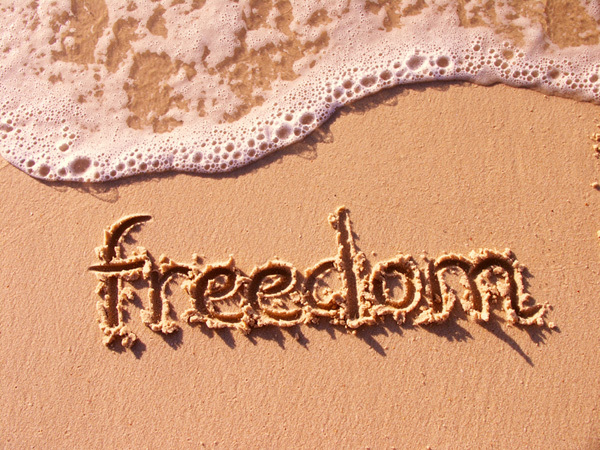 Most people want to be free…free from worry, free from stress, free to make choices, free to live all out on their terms. People have fought for it, died for it and hungered for it for as long as recorded history and I imagine even before. Well let me say right off, the specific context and manifestation of freedom varies by person and circumstance however at the core I believe the three concepts of courage, concentration and conviction are cornerstones to freedom. Courage. The dictionary says courage is “the quality of mind or spirit that enables a person to face difficulty, danger, pain, etc., without fear; bravery.” Some say courage is acting despite fear. Whether without it or in spite of it, courage is an opposing state to fear. This week in our MKMMA reading fear is discussed significantly. Fear is considered the one arch enemy to the shining of our personal light and optimal power, and must be destroyed. One sentence from our reading says of fear, “It is the personal devil which makes men fear the past, the present and the future; fear themselves, their friends and their enemies; fear everything and everybody.” Further, “…when you can consciously realize your ability to overcome any adverse condition by the power of your thought, you will have nothing to fear.” Remember the Apostle Paul centuries ago said to his protege Timothy, “For God has not given us the spirit of fear, but of power, and of love, and of a sound mind.” (2 Timothy 1:7). Our goal then is to be too busy radiating courage, confidence, and power that fear cannot inhibit our ability to live free. Develop your courage muscles! Concentration. One of my favorite sentences in this weeks reading is, “Mentally concentrate on the object of your desire; when you are concentrating you are impressing the subconscious. It is not the only way, but is a simple and effective way and the most direct way in which the best results are secured.” Concentration is about paying exclusive attention to one object; a focused application of our mental energies. In a recent post I talked about how focus contributes to breakthroughs. Keep in mind the underlying principle of this whole study, is that you become what you think about, as Earl Nightingale put it in his famous recording, The Strangest Secret in the World. Another way to think of it is the idea of cause and effect…thought is the cause and the resulting experience is the effect. With that as the premise, it’s just plain smart to concentrate on what you want, affirmative and desirous outcomes vs. anything else. Focus, concentrate, experience! Conviction. Conviction is a fixed or firm belief. And belief is confidence in the truth or existence of something not immediately susceptible to rigorous proof. I’ll take it one step forward and say that the state of belief is one in which you don’t know, scientifically that something is or will be, nor do you know exactly how it will come to be, but you have no doubt that it will be…and are not overly concerned about how it happens. It’s about not knowing how but wholeheartedly expecting that it will be. What is really cool about this idea is that it is not our charge to “consciously” know how–that is the job of our subconscious mind. Remember, “it is not necessary to outline the method by which the subconscious will produce the results we desire. The finite cannot inform the Infinite.” From a spiritual perspective I would say, finite man, with our limitations, cannot inform God, who is and has infinite resources, how to make things happen. Our job is to hold the thought–say what we desire and believe, trust that it will be and act accordingly. The how will show up…and often amaze us. With courage, concentration and conviction firmly in place we can and should relax…removing all self imposed pressure and eliminate all tensions allowing our mental faculties to exercise the greatest freedom of all, creation. Three C’s to freedom. Choose it!! Tags: concentration, conviction, courage, freedom, relaxation, subconscious mind | Permalink. I love the three C’s to freedom, thank you. Fantastic post Celeste! We truly have the power to control our thoughts, and by extension , we create the conditions within, to affect our world without. I love your post! very insightful. I was walking last night in the dark with my dog and looked up through the trees and noticed how infinite space is. My naked eyes can’t see all that needs to be seen. Yet knowing that we are connected through our subconcious is pretty amazing. Love your title. All 3 characteristics are important to creates habits for.